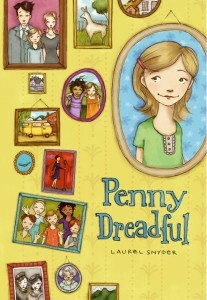 Laurel Snyder » Blog Archive » The Penny Dreadful Book Club!!! This entry was posted on Sunday, October 17th, 2010 at 6:45 am	and is filed under Blog. You can follow any responses to this entry through the RSS 2.0 feed. You can leave a response, or trackback from your own site. Oh, Laurel. We are so in if you would let us be. I love the idea of my older kids going back and picking up these classic kid-lit books. I think this will be an enrichment activity for everyone involved. I will start pitching this tomorrow morning. I know I will be able to hook a couple of girls on this right away (and I am hoping to get a guy in there or two). We could hang the Skype visit as a carrot. I see this as all grades activity, 9-12, don’t you? I think that a 12th grade could do this in an entirely different way, because at that age they’re getting the skills to really talk critically about things. So yes, absolutely! We could even come up with some new/old pairings, or sets of books where there’s a lot to say about the contrast between titles. What a great idea. A great blend of old and new technology! I think it’s an awesome idea. I’ve shared the details with my daughters’ teachers already. If they don’t grab at it I may have to form my own club with the neighbor girls. Long story short: I found your website, and although I am a book-a-holic homeschooling mum to six, my eldest 3 are aged 7, 5 and 4 and therefore we probably don’t qualify, but I really wanted to thank you for the list of great books. That’s a gift in itself! No aplogies needed! It’s a big world full of books and authors, and I’m not famous by a long shot. Your kids are probably too young to read the books on this list, as a book club. But if you guys read three as a family, and they want to “chat” we can absolutely do that. Or, if your oldest wants to email me, I’m always happy to interact with readerly kids. Won’t be participating in this, but wanted to say I love the list books. I’ve read 25 of them, and reread several (Swallows and Amazons is my all-time favourite children’s book); may have to add the others to my read-this-someday list. Laurel, this is just such a brilliant idea! And thank you so much for including Olivia Kidney in the selection. What an honor! I am a 4th grade teacher in North Plainfield, NJ. I would like for you to consider a reading group of mine (7 kids) for participation in your Penny Dreadful Book Club/Skype sessions. The group would like to read The Phantom Tollbooth, The Island of the Aunts, and Savvy as their selections. I also will be reading Bridge to Terabithia (as a teacher read-aloud) with my entire class and would like to inquire about a Skype session with them to discuss that selection. We would be thrilled to have the opportunity to read some of your favorites and discuss them with you. I look forward to hearing back from you at your convenience.